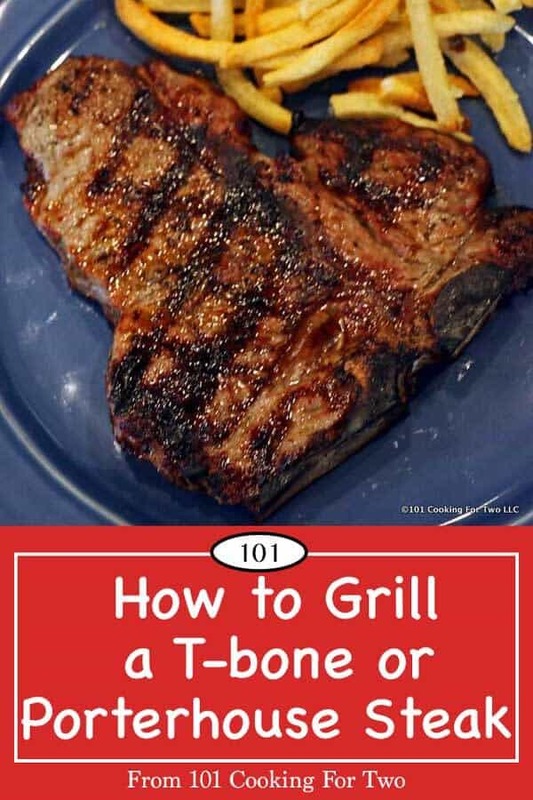 How to grill a T-bone steak seems to be a problem for a lot of people. Learn how with these easy to follow step by step photo instructions. You can be the “grill master” too and have an excellent grilled steak in 10 minutes every time. 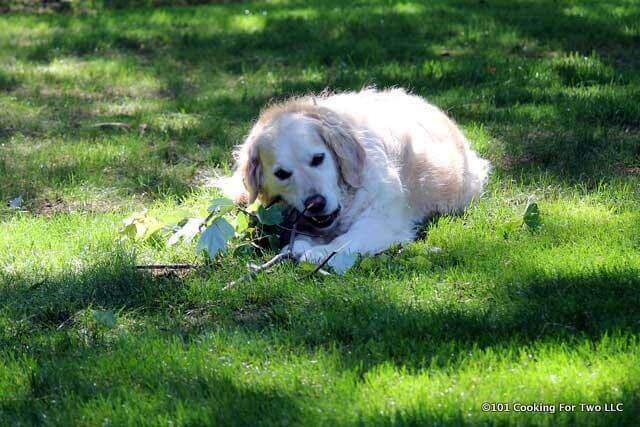 Editor’s Note: Originally Published July 27, 2013. Updated with updated text and re-edited pictures. Fortunately, it is very simple to get great results. Start with a great steak, season simply and cook over high heat. And what is more traditional than a T-bone or porterhouse steak. Let’s get to it. The grade of beef is critical to the outcome. This is fairly easy. U.S. Prime is in the top 2%. It is upper-end restaurant type stuff. Expensive and you probably will not pay the price. U.S. Choice is where you’re buying. About half of all beef falls into the Choice category. U.S. Select (formerly Good) does sound OK, and it is just that “OK.” It is the lowest grade commonly sold at retail and is less juicy and tender. I use Choice. I have a good “look” at it since choice covers most of the market, and the marbling can be quite variable. Also, I want the market to trim it well. I don’t like paying $12+ a pound for a large piece of fat that should have been trimmed off. 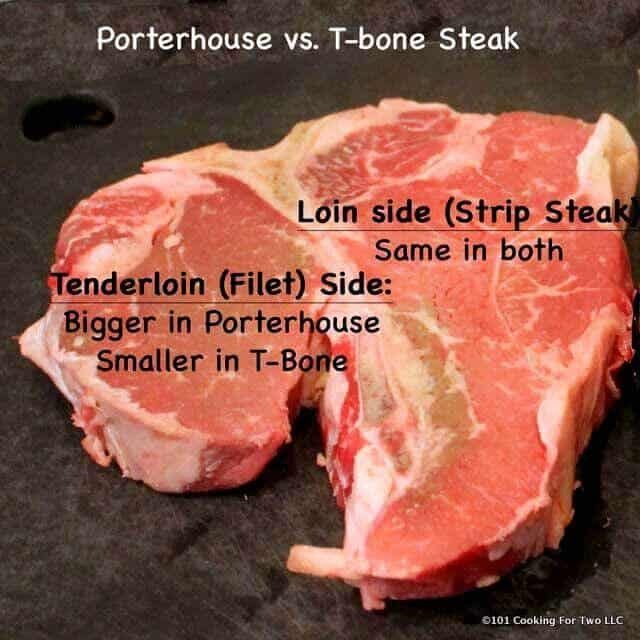 Both the T-bone and porterhouse steaks come from the short loin which is between the rib and the sirloin. The larger side is strip steak, and the small side is a tenderloin (filet). 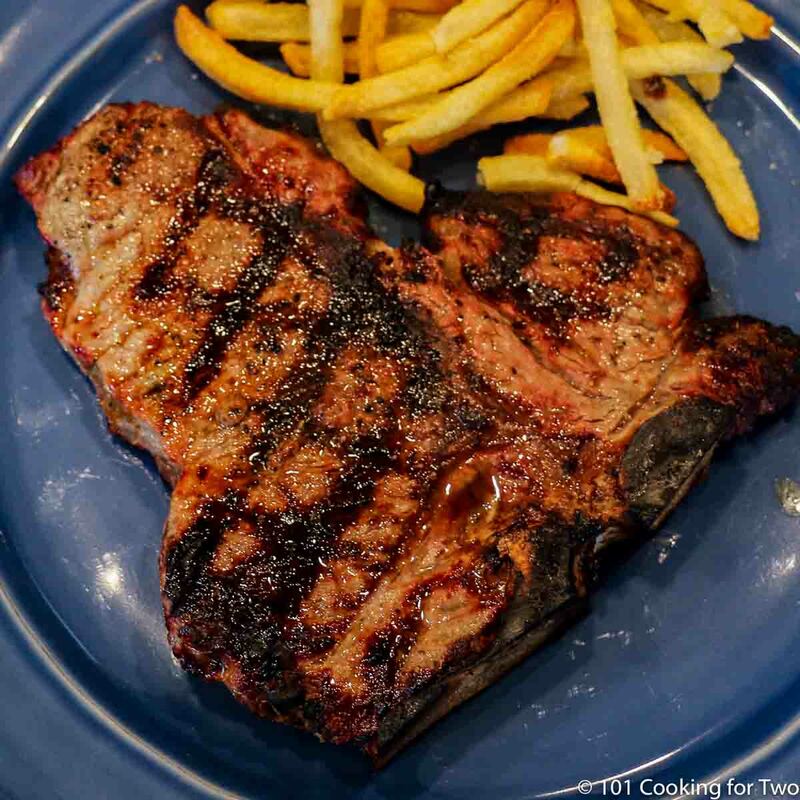 In a T-bone, the tenderloin must measure a minimum of 1/2 inch across the center and the porterhouse a minimum of 1 1/4 inches. 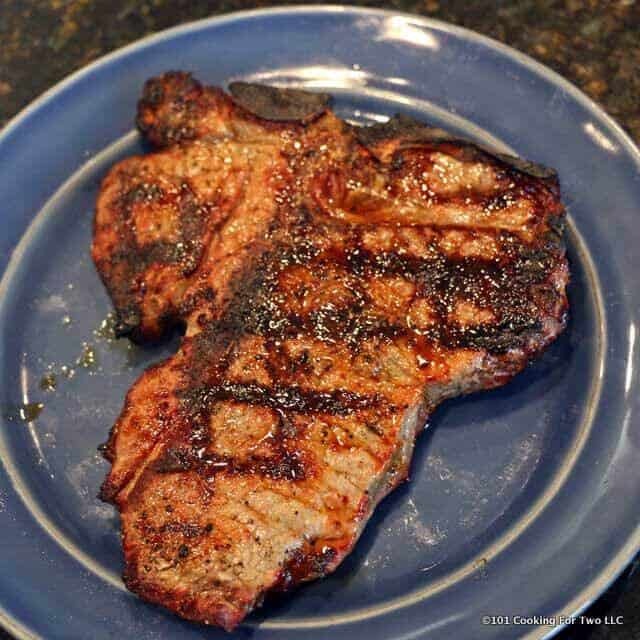 So T-bone and porterhouse steaks are the same cut of meat except for more filet on the porterhouse. If they are the same price, get the porterhouse. My wife is a porterhouse hound. Thickness: all the “experts” want 1 1/2 inch… that is a pound and a half of cow. Have your butcher cut it at 1 inch. You will find both 1 inch and 3/4 inch in the pre-cut. I think the 3/4 is a little too thin, and I want some meaty center. Cow type: I find Angus a bit tastier. Any grill should work. I use natural gas. A charcoal grill will be fine also. You just need to get it hot…very hot. My grill has a surface temperature that is routinely at 650 degrees plus. You don’t need that hot. I should note that there is a reverse searing method of cooking that is somewhat the opposite of this approach. You start with a low grill and get the meat to about the internal temperature you want and then crank it up to finish with a sear. It sounds a little fussy to me. I will try it someday. This is so easy. Allow the meat to rest at room temperature if possible. This is not ground meat, so it is safe but anything over an hour makes me nervous, and I wouldn’t do. If you don’t rest it, you will need to cook a little longer to get the internal temp you want. Read that as dry it out. Trim the extra fat. You won’t eat it, and it will cause flair on the grill that will burn your expensive meat. Salt. There is some debate about the timing here. 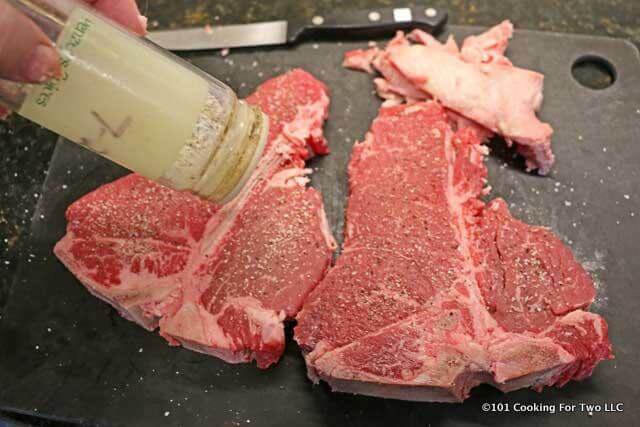 Salt will pull the water out of meat, but then the salt and the water will absorb back into the meat. That take 45 to 60 minutes. So if you salt at the start of the rest, it is really good. If you salt at the end, it is good also but maybe not as good. Do not salt with less than an hour left in the rest unless it is the last 10 minutes. This may pull water out of the meat, and it will not have time to re-absorb. Seasoning. Pepper is a must, and we like garlic so my 7:2:2 seasoning (see my post on making 7:2:2 HERE) is perfect here. Or just use salt and pepper. I put the pepper and garlic on with the salt. See above salt note. Oil: not needed. Masterchef ( in the comments) is a pro who has spent many years doing this. He suggests a light brushing of oil on the meat and not the grill. I have tried his suggestion and could not tell the difference. Your choice. 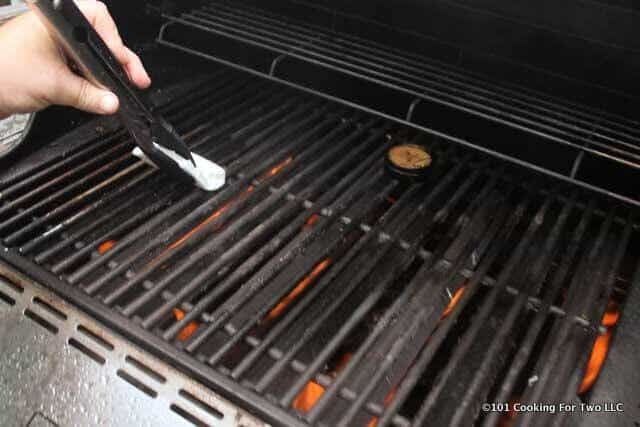 The Grill: The grates must be cleaned and oiled. The grate is going to be very hot, and olive oil has a lower smoke point. 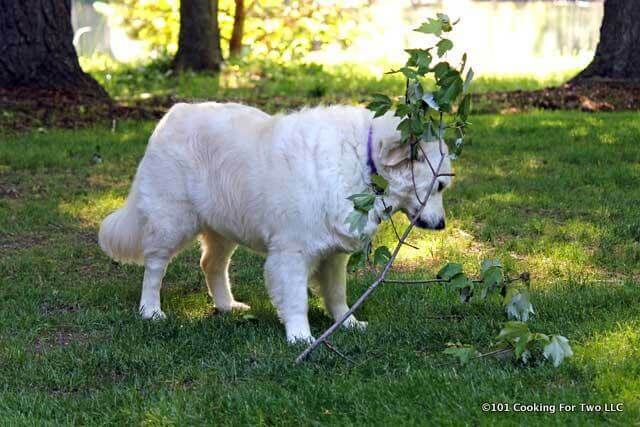 Use standard vegetable oil. Grill the first side for 5 minutes. Use a watch and do not just guess. If you are into cross grill marks, rotate 90 degrees at 2 1/2 minutes. After the 5 minutes then flip. Cook on the second side for about 3 minutes for rare, 4 for medium-rare and 5 for medium. We like our meat at about 145. That is overcooked for many. There are some variables with those suggested times. The exact grill temperature, the exact starting temperature of the steak and the thickness of the steak. All this means you must check the internal temperature to get exactly the results you want. 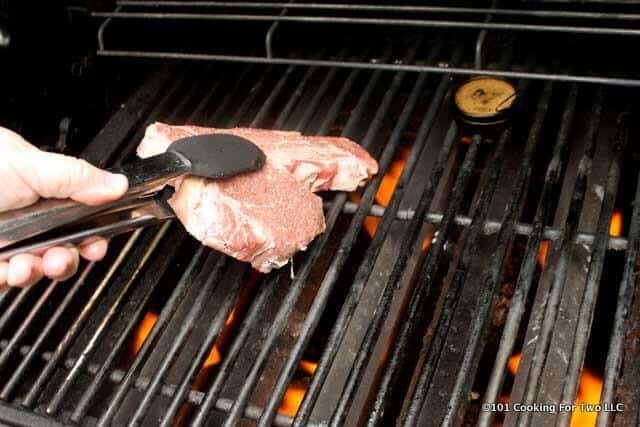 You will read about a “touch” method to check if the steak is done. It probably works for pros or semi-pros but really for us normal people not so much. Get the thermometer out. The Rest: DO NOT SKIP. During the cooking process, water comes out of the cells. If you cut the meat immediately, it will just drain on your plate. Let it rest lightly tented in foil uncut at least 5 minutes, but ten is better. The fluid will absorb back into the meat. Steak sauce: need I say this… just say NO. 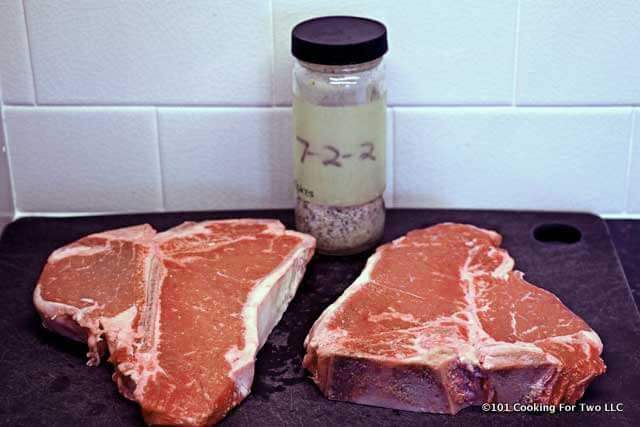 Rest the steaks at room temperature for about 1 hour if possible allowing the steaks to come to room temperature. Trim the beef of extra fat. This is important to prevent “flare-ups” that will burn your expensive meat. Apply salt and pepper at the start of you resting period. At the end is OK if skipping the rest or you forgot. Use coarse salt and pepper. I used my 7:2:2 which is kosher salt: pepper: garlic. Preheat your grill to maximum. Yep, as hot as it will go. Clean and oil well. Do not just olive oil here due to the low smoke point. In five minutes (by the clock) flip the meat. If you’re into crossed grill marks, you should have rotated the meat 90 degrees at about 2 1/2 minutes. Grill for approximately three more minutes for rare, four more minutes for medium-rare and 5 minutes for medium (150). 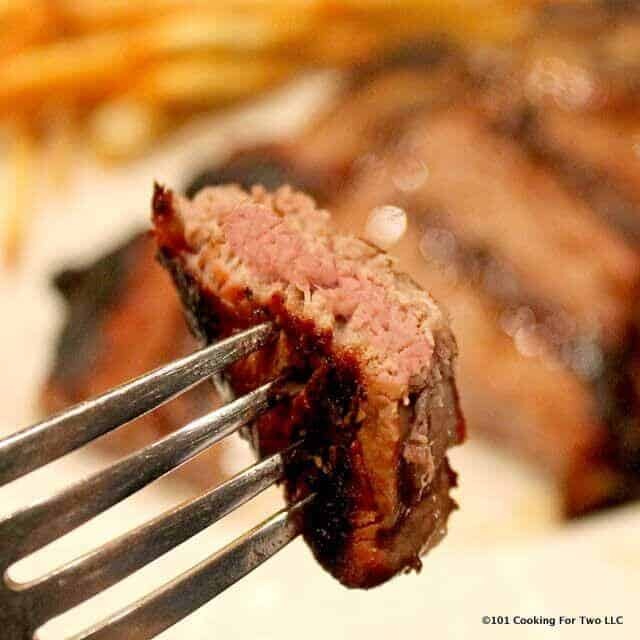 Your timing will vary a little so as always, check the internal temperature with an instant-read meat thermometer. Never cook by time alone. Rest before serving by lightly tenting with foil for 5 to 10 minutes. Trim the beef of extra fat. This is important to prevent "flare-ups" that will burn your expensive meat. Place over direct heat. In five minutes (by the clock) flip the meat. If you are into crossed grill marks, you should have rotated the meat 90 degrees at about 2 1/2 minutes. Grill for approximately three more minutes for rare, four more minutes for medium-rare and 5 minutes for medium (150). Your timing will vary a little so as always, check the internal temperature with an instant-read meat thermometer. Never cook by time alone. Rest before serving by lightly tenting with foil for 5 to 10 minutes. Trim the fat to prevent flareups. Grill as hot as it will go. Rest if room temperature before grilling. Salt either 1 hour before cooking or just before. Not between. There are some variables with those suggested times on the second side. The exact grill temperature, the exact starting temperature of the steak and the thickness of the steak. All this means you must check the internal temperature to get exactly the results you want. DO NOT USE ONLY TIME. This is for 3/4- 1 inch thick give or take a little. 1 1/2 inch max. If you are into to 2 inch thick, different technique is needed. If about 1 1/2 inch be sure to rest to room temperature at the start or the center will be rare... unless that is what you like. 1 1/2 inch will be almost 2 pounds. In South Africa we grill on what we call a braai. You can use charcoal but the best is to use “bushwood”…it’s the wood that is indigenous but exotic woods like “Rooikrans” (Port Jackson}..exotic from Australia is also ideal. We use a hot fire with a bit of flame…I don’t trim the fat as I encourage a bit of flaring but do it quickly and turn it quickly. I then rest the meat for a while on a thick wooden board to drain a bit…I do not salt but use only black ground pepper. I cook it very quickly but I only use well hung steak…rump, sirloin (porterhouse) and t-bone. Yes, Angus is best but so is Brahman cross Angus… Brangus. I like it thick 2″ but one and a half is ok. I like the charcoal effect…I don’t burn it , only sear it a bit…it not only looks appetising like this but tastes better. It’s a gut feel for me…a skill developed…really can’t stereotype the recipe…it really is a skill…an art that developes through time and experience. I bought two beautiful porterhouse steaks at, of all places…BJ’s, Westbury, LI, NY. These steaks are approaching 2″ thick and since I haven’t cooked such a nice steak in awhile I searched, duckduckgo (not Google) and Dr. Dan your website was first in line and I’m so glad I found you. Concise easy reading with common sense commentary from you throughout your recipe. As soon as I click on “post comment” I will subscribe to your website. I do love Angus beef (the best) so that is great. At 1 1/2 inch that is about approaching a pound and a half. My wife could get through it but I couldn’t. I’m better with 1 inch but this technique is good for 3/4 to 1 1/2. Over that is more of a reverse searing grilling. A whole different thing. My local Leppinks had the same deal this week and I’m going to surprise her with porterhouse this weekend. I don’t have to walk as much at Leppinks which is a problem for me now. I do Meijer about 2-3 times per month. i’m usually a n.y. strip man but saw some fine looking porterhouse at the store and will give it a go. 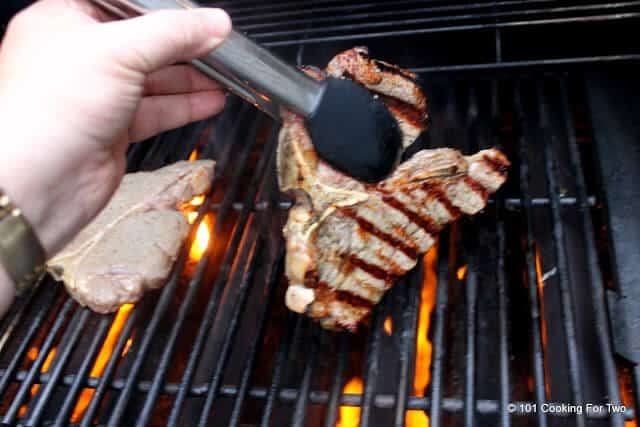 i’ve been using a large george forman grill for many years and it works great with the strip steak but have never tried a bone in cut. ialways use a timer and thermometer and salt and pepper. french fries, broccoli and cauliflower and glass of wine does it for us.